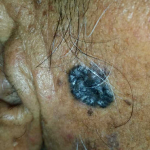 Other rare forms of skin malignancy include lymphomas, Merkel cell carcinoma, and carcinoma of other tissue in the skin, including sarcomas as well as hair and sweat gland tumours. 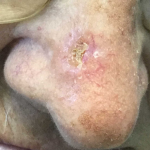 Squamous cell carcinoma may be painful. Both forms of skin malignancy may appear as a sore that bleeds, oozes, crusts, or otherwise will not heal. They begin as a slowly growing bump on the skin. Skin lesion may bleed after minor trauma. 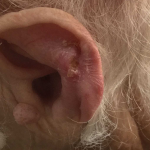 Both kinds of skin malignancy may have raised edges and a central ulceration. crusty lesions caused by damage from ultraviolet light, often in the facial area, scalp, and backs of the hands. These are considered precancers because if untreated, up to 10% of actinic keratoses may develop into squamous cell carcinoma. an increasing number of people who are immunosuppressed. There are several effective means of treating skin cancer. The choice of therapy depends on the location and size of the tumour, the microscopic characteristics of the cancer, and the general health of the patient. Topical medications: In the case of superficial basal cell carcinoma, some creams, gels, and solutions can be used, including imiquimod, which works by stimulating the body’s immune system causing it to produce interferon which attacks the cancer, and fluorouracil (5-FU), a chemotherapy drug. Destruction by electrodessication and curettage (EDC): The tumour area with a local anesthetic is repeatedly scraped and the edge is then cauterized. The advantage of this method is that it is fast, easy, and relatively inexpensive. Surgical excision: The area around the tumour with local anesthetic removed and then the wound edges are closed by suture. For very big tumours, skin grafts or flaps are needed to close the defect. Micrographic surgery: The site is locally anesthetized and removes the visible tumour with a small margin of normal tissue. The tissue is immediately evaluated under a microscope and areas that demonstrate residual microscopic tumour involvement are re-excised and the margins are re-examined. This cycle continues until no further tumour is seen. Radiation therapy: Ten to fifteen treatment sessions deliver a high dose of radiation to the tumour and a small surrounding skin area. This treatment is for those who are not a patient for surgical procedure. When anyone suspects a bad tumour, must consult with a doctor as soon as possible. First time: as soon as possible visit a Dermatologist. After that, Doctors will decide you visit schedule.